زعفران یکی از با ارزش­ترین گیاهان دارویی ایران است که در حوزة پراکنش خود تحت تأثیر برخی از تنش­های محیطی می­باشد. بنابراین، مصرف ترکیبات هورمونی و غذایی می­تواند ضمن کاهش آثار سوء تنش، موجبات افزایش رشد و عملکرد گیاه را فراهم سازد. به همین منظور آزمایشی در قالب طرح بلوک­های کامل تصادفی با چهار تکرار با هدف بررسی اثر غوطه­وریِ بنه­های مادری زعفران در سطوح مختلف اسید سالیسیلیک (5/0، 1 و 2 میلی مولار) و نیترات پتاسیم (250، 500، 1000 میلی­گرم بر لیتر) به همراه تیمار شاهد (آب مقطر به عنوان سطح صفر برای هر یک از ترکیبات مورد استفاده) روی برخی صفات مرتبط با رشد رویشی و زایشیِ زعفران در مزرعه تحقیقاتی دانشکده کشاورزی بیرجند در سال زراعی 1394 اجرا شد. صفات مورد بررسی شامل وزن­تر گل، وزن­تر گلبرگ، وزن­تر کلاله، طول کلاله، طول برگ، وزن و قطر بنة مادری و دختری، میزان کلروفیل کل و فلورسانس کلروفیل (با هدف بررسی تأثیر تیمارهای آزمایشی بر خسارت احتمالیِ ناشی از تنش گرمای تابستانه) بودند. نتایج نشان داد که بیشترین میزان Fv، Fv/Fm،F'v/F'm (به­ترتیب 117، 27/0 و 44/0)، کلروفیل کل (85/0 میکروگرم بر گرم وزن­تر)، وزن­ترگل، وزن­ترگلبرگ، وزن­ترکلاله (به ترتیب 9/36، 1/32 و 2/4 گرم در متر مربع)، طول کلاله و طول برگ (به­ترتیب 6/29 میلی­متر و 7/37 سانتی­متر) در تیمار غوطه­وریِ بنه در محلول 2 میلی­مولار اسید سالیسیلیک و بیشترین میزان F'm به مقدار 434 در سطح 5/0 میلی­مولار اسید سالیسیلیک به دست آمد. تیمار مصرف 1000 میلی­گرم بر لیتر نیترات پتاسیم نیز به ترتیب موجب افزایش 19 و 30 درصدیِ مقادیر قطر و وزن بنه دختری گردید. در مجموع، نتایج این آزمایش نشان داد که غوطه­وری بنه­های مادری زعفران در محلول‌های اسید سالیسیلیک و نیترات پتاسیم موجب بهبود رشد و عملکرد زعفران می­شود. 1M.Sc. Department of Horticultural Science, Faculty of Agriculture, University of Birjand, Birjand, Iran. 2Assistant Professor Department of Horticultural Science, Regional Institute of Special Plants, Faculty of Agriculture, University of Birjand, Birjand, Iran. 3Assistant Professor, Department of Agronomy and Plant Breeding, Regional Institute of Special Plants, Faculty of Agriculture, University of Birjand, Birjand, Iran. 4Department of Agronomy and Plant Breeding, Faculty of Agriculture, University of Birjand, Birjand, Iran. Saffron that is an important medicinal plant of Iran is influenced by several environmental stresses. Therefore, the consumption of appropriate hormonal and nutritional compounds can reduce the negative impacts of stresses on it and improve the growth and yield of the plant. For this purposes, an experiment was carried out based on a Randomized Complete Block Design with four replications to study the effect of Salicylic acid (0, 0.5, 1 and 2 mM) and Potassium Nitrate (0, 250,500 and 1000 ml.g-1), in the research field station of the College of Agriculture, the University of Birjand, Iran, in the growing season of 2015. The indices evaluated included flower and corolla fresh weight, stigma weight and length, leaf length, corm and cormel weights and diameter, chlorophyll florescence parameters and total chlorophyll content. The results showed that the highest amounts of Fv, Fv/Fm, F'v/F'm (117, 0.27 and 0.44, respectively), total chlorophyll (0.85 µg.g fresh weight), flower and corolla fresh weight (36.9 and 32.1 g.m-2, respectively), stigma weight (4.2 g.m-2) and length (29.6 mm) and leaf length (37.7 cm) were obtained at 2 mM level of salicylic acid, while the highest F'm was recorded at 0.5 mM salicylic acid. In addition, pretreatment with 1000 mg.l-1 potassium nitrate increased the amounts of cormel weight and diameter by 30% and 19% compared with the control, respectively. Generally, the results of this experiment indicated an enhancement in saffron growth and yield, affected by corms soaking in salicylic acid and potassium nitrate. Agarawal, S., Sairam, R.K., Srivasta, G.C., and Meena, R.C. 2005. Changes in antioxidant enzymes activity and oxidative stress by abscise acid and salicylic acid in wheat genotypes. Biologia Plantarum 49 (4): 541-550. Amir, B.K. 2006. Response of Sword Lily, Gladiolus to increase dose of nitrogen and phosphorus. M.Sc Thesis. Sindh Agriculture. University Tando Jam. Arnon, D.I. 1949. Copper enzymes in isolated chloroplasts. polyphenoloxidase in Beta Vulgaris. Plant Physiology 24: 1-15. Azizbekova, N.Sh., Milyaeva, E.L., Lobova, N.V., and Chailakhyan, M.Kh., 1976. Effects of gibberellins and kinetin on formation of flower organs in saffron crocus. Plant physiology 25: 471-476. Azizbekova, N.Sh., Milyaeva, E.L., and Chailakhyan, M.Kh. 1983. Effect of gibberellins on functional activity of dormant saffron buds. Soviet Plant physiology 29: 895-900. Baker, N.R., and Rosenqvist, E. 2004. Applications of chlorophyll fluorescence can improve crop production strategies: an examination of future possibilities. Journal of Experimental Botany 55: 1607-1621. Behdani, M.A., Koocheki, A., Rezvani Moghaddam, P., and Jami Al-Ahmadi, M. 2008. Agroecological zoning and potential yield of saffron in Khorasan-Iran. Journal of Biological Sciences 8 (2): 298-305. Behdani, M.A., and Fallahi, H.R. 2015. Saffron: Technical Knowledge Based on Research Approaches. University of Birjand Publication. (In Persian). Behnia, M.R., Estilai, A., and Ehdaie, B. 1999. Application of fertilizers for increased saffron yield. Journal of Agronomy and Crop Science 182: 9-15. Chrungoo, N.K., and Farooq, S. 1984. Influence of gibberellic acid and naphthalene acetic acid on the yield of saffron and on growth in saffron crocus (C. sativus L.). Indian Journal of Plant physiology 28: 201-205. El-Bassiony, A.M. 2006. Effect of potassium fertilization on growth and physiology of Gladiolus bulb. Journal of Applied Science and Research 2 (10): 780-785. El-Tayeb, M.A. 2005. Response of barley grain to the interactive effect of salinity and salicylic acid. Plant Growth Regulation 42: 215-224. Eraslan, F., Inal, A., Pilbeam, D.J., and Gunes, A. 2008. Interactive effects of salicylic acid and silicon on oxidative damage and antioxidant activity in spinach (Spinacia oleracea L. CV. Matador) grown under boron toxicity and salinity. Plant Growth Regulation 55: 207-219. Gao, D., Cai, K., Chen, J., Luo, S., Zeng, R., Yang, J., and Zhu, X. 2011. Silicon enhances photochemical efficiency and adjusts mineral nutrient absorption in Magnaporthe oryzae infected rice plants. Acta Physiologiae Plantarum 33: 675-682. Ghai, N., Setia, R.C., and Setia, N. 2002. Effect of paclobutrazol and salicylic acid on chlorophyll content, hill activity and yield components in Brassica napus L. (cv. GSL-1). Phytomorphology 52: 83-87. Ghoname, A., Fawzy, Z.F., El-Bassiony, A.M., Riadand, G.S., and Abd El-Baky, M.M.H.. 2007. Reducing onion bulbs flaking and increasing bulb yield and quality by potassium and calcium application. Australian Journal of Basic and Applied Sciences 13 (2): 123-133. Gutierrez-Corronado, M.A., Trejo-Lopez, C., and Larque-Saavedra, A. 1998. Effects of salicylic acid on the growth of roots and shoots in soybean. Plant Physiology and Biochemistry 38 (4): 563-565. Horvath, E., Janda, T., Szalai, G., and Paldi, E. 2002. In vitro salicylic acid inhibition of catalase activity in maize: differences between the isozymes and a possible role in the induction of chilling tolerance. Plant Science 163 (6): 1129-1135. Juan, J.A.D., Córcoles, H.L., M-Munoz, R., and Picornell, M. 2009. Yield and yield components of saffron under different cropping systems. Industrial Crops Production 30: 212–219. Khan, W., Prithiviraj, B., and Smith, D. 2003. Photosynthetic responses of corn and soybean to foliar application of salicylates. Plant Physiology 160: 485-92. Khodary, S.E.A. 2004. Effect of salicylic acid on the growth, photosynthesis and carbohydrate metabolism in salt stressed Maize plant. International Journal of Agriculture and Biology 6: 5-8. Koocheki, A.R., and Jahan, M. 2009. Effect of bio fertilizer and inorganic fertilizer on generative growth and yield of saffron under high corn density. 3rd International Symposium on Saffron Forthcoming Challenges in cultivation Research and Economics. 20-24 May. Krokos, Kozani, Greece. Krishna, S., Surinder, K., Thind, S.K., and Gurpreet, K. 2004. Interactive effects of phenolics and light intensity on vegetative parameters and yield in soybean (Glycine max L. Merrill). Environment and Ecology 22: 390-394. Leslie, C.A., and Romani, R.J., 1988. Inhibition of ethylene biosynthesis by salicylic acid. Plant Physiology 88: 833-837. Lichtenthaler, H.K. 1992. The Kaustky effect: 60years of chlorophyll fluorescence induction kinetics. Photosynthetica 27: 45-55. Lu, C., Qiu, N., Lu, Q., Wang, B., and Kuango, T. 2002. Does salt stress lead to increased susceptibility of photosystem II to photoinhibition and changes in photosynthetic pigment composition in halophyte Sueda salsa grown outdoors? Plant Science 163: 1063-1068. Majd, A., Maddah, S.M., Fallahian, F., Sabaghpour, S.H., and Chalabian, F. 2006. Comparative study of the effect of salicylic acid on yield, yield components and resistance of two susceptible and resistant chickpea cultivars to Ascochyta rabiei. Iranian Journal of Biology 19 (3): 314-324. (In Persian with English Summary). Mansouri, M., Shoor, M., Tehranifar, A., and Selahvarzi, Y. 2015. Effect of foliar application of salicylic acid and thiamine on quantitative and qualitative characteristics of gerbera (Gerbera jamesonii L. cv. Pink Elegance). Journal of Science and Technology of Greenhouse Culture 6 (23): 15-24. (In Persian with English Summary). Marschner, P. 2012. Mineral Nutrition of Higher Plants, 3rd ed. ; Academic Press: London, UK. pp; 178–189. Memon, S.A., Baloch, A.R., Baloch, M.A., and Keerio, M.I. 2013 Pre-soaking treatment and foliar application of KNO3 on growth and flower production of gladiolus (Gladiolus hortulanus). Journal of Agricultural Technology 9 (5): 1347-1366. Moein, P., and Mortazaeinezhad, F. 2014. The survey of gibberellic acid, kinetin, salicylic acid, treatments on the reproductive traits of Saffron (Crocus sativus L.). The 1st International Conference on New Idea in Agriculher. Islamic Azad University Khorasgan Brangh. 26-27 Jan. 2014. Isfahan, Iran. (In Persian). NadeAli, E., PakNejad, F., Moradi, F., Nasri, M., and Pazuki, A. 2010. Effects of methanol application on sugar beet (Beta vulgaris) relative water content, chlorophyll content and chlorophyll fluorescence parameters under drought stress conditions. 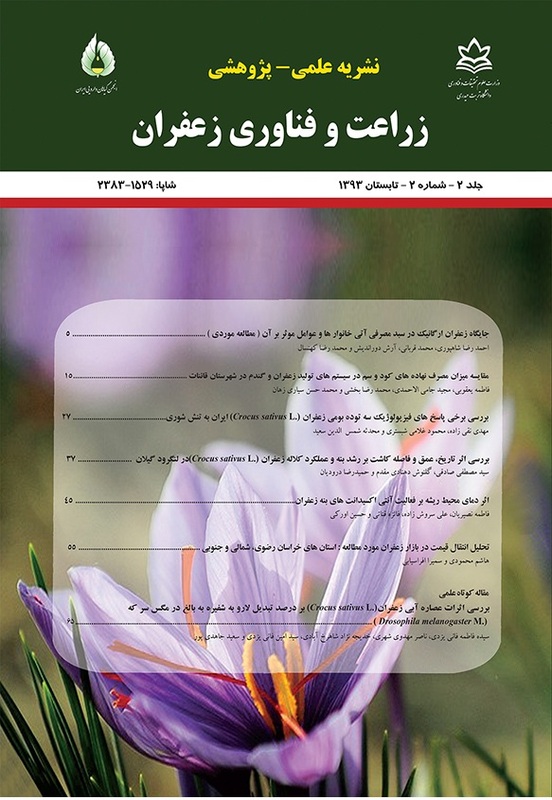 Iranian Journal of Field Crop Science 41 (4): 731-740. (In Persian with English Summary). Negbi, M. 1999. Saffron Cultivation: Past, Present and Future Prospects. Harwood Academic Publishers, Amsterdam .pp. 1-19. Nelson, B.M.N., and Maria, A.B.D. 2006. Physiological and biochemical response of common bean varieties treated with salicylic acid under water stress. Crop Breeding and Applied Biotechnology 6: 269-277. Padmalatha, T. G., Satyanarayana Reddy, R., Chandrasekhar, A., Shankar, S., and Chaturvedi, A. 2013. Effect of pre-planting soaking of corms with chemical and plant growth regulators on dormancy breaking and corm and cormel production in Gladiolus. International Journal of Plant, Animal and Environmental Sciences 3 (1): 28-33. Paknejad, F., Nasri, M., Tohidi Moghadam, H.R., Zahedi, H., and Jami Alahmad, M., 2007. Effects of drought stress on chlorophyll fluorescence parameters chlorophyll content and grain yield of wheat cultivars. Journal of Biological Sciences 7 (6): 841-847 . Pancheva, T.V., Popova, L.P., and Uzunova, A.N. 1996. Effects of salicylic acid on growth and photosynthesis in barley plants. Journal of Plant Physiology 149: 57-63. Popova, L., Pancheva, T., and Uzonova, A. 1997. Salicylic acid: properties, biosynthesis and physiological role. Plant Physiology 23: 85-93. Popova, L., Ananieva, V., Hristova, V., Christov, K., Geovgieva, K., Alexieva, V., and Stoinova, Z. 2003. Salicylic acid and methyl jasmonate induced protection on photosynthesis to paraquat oxidative stress. Bulgarian Journal of Plant Physiology (Special issue) 133- 152. Popova, L.P., Maslenkova, L.T., Yordanova, R.Y., Ivanova, A.P., Krantev, A.P., Szalai, G., and Janda, T. 2009. Exogenous treatment with salicylic acid attenuates cadmium toxicity in pea seedlings. Plant Physiology and Biochemistry 47: 224-231. Rai, V.K., Sharma, S.S., and Sharma, S. 1986. Reversal of ABA–induced stomatal closure by phenolic compounds. Journal of Experimental Botany 37: 129–34. Ramazan. A., Hafiz, I.A., Ahmad, T., and Abbasi, N.A. 2010. Effect of priming with potassium nitrate and dehusking on seed germination of gladiolus (Gladiolus Alatus) Pakistan Journal of Botany 42 (1): 247-258. Raskin, I. 1992. Role of salicylic acid in plants. Annual Review of Plant Physiology and Plant Molecular Biology 43: 439-463. Rezvani-Moghaddam, P., Huda, A.K.S., Parvez, Q., and Koocheki, A. 2007. Indigenous knowledge in agriculture with particular reference to medicinal crop production in Khorasan, Iran. World Association for Sustainable Development Conference Proceedings 2007. Brisbane, Australia, pp. 105-115. Roychowdhury, N., and Roychowdhury, P. 2006. The effect of field application of k on post-harvest behaviour of gladiolus. International Journal of Horticulture 3 (1): 33-35. Shabala, S.I. 2002. Screening plants for environmental fitness: chlorophyll fluorescence as a ‘‘Holy Grail’’ for plant breeders. In: Hemantaranjan, A., (Ed. ), Advances in Plant Physiology. Vol. 5. Scientific Publishers, Jodhpur, India, pp. 287–340. Sarkar, R.K., and Malik, G.C. 2001. Effect of foliar spray of potassium nitrate and calcium nitrate on grasspea (Lathyrus sativus L.) grown in rice fallows. Lathyrus Lathyrism Newsletter 2: 47-48. Sathiyamoorthy, P., and Vivekanandan, M. 2008. Cumulative effects of pre-sowing seed treatment and foliar application of salts in improving biomass and grain yield of soybean in moderate saline/alkaline soil. Journal of Agronomy and Crop Science 161 (2): 107-113. Shakirova, F.M., Sakhabutdinova, A.R., Bozrutkova, M.V., Fatkhutdinova, R.A. and Fatkhutdinova, D.R. 2003. Changes in the hormonal status of wheat seedlings induced by salicylic acid and salinity. Plant Science 164: 317-322. Shi, Q., Bao, Z., Zhu, Z., Ying, Q., and Qian, Q. 2006. Effects of different treatments of salicylic acid on heat tolerance, chlorophyll fluorescence and antioxidant enzyme activity in seedlings of Cucumis sativa. Plant Growth Regulation 48: 127-135. Shi, G.R., Cai, Q.S., Liu, Q.Q., and Wu, L. 2009. Salicylic acid-mediated alleviation of cadmium toxicity in hemp plants in relation to cadmium uptake, photosynthesis, and antioxidant enzymes. Acta Physiologia Plantarum 31: 969-977. Singh, K.P., Ramachandran, N., and Uma, S.1997. Growth, flowering, corm yield and corm-rot incidence as affected by level and frequency of potassium application in gladiolus (Gladiolus grandiflorus). Indian Journal of Agricultural Science 67 (9): 404-406. Singh, B., and Usha, K. 2003. Salicilic acid induced physiological and biochemical changes in wheat seedling under water stress. Plant Growth Regulation 39: 137-141. Tammam, A.A. 2003. Response of Vicia faba plants to the interactive effect of sodium chloride salinity and salicylic acid treatment. Acta Agronomica Hungarica 51 (3): 239-248. Tari, I., Csiszar, J., Szalai, G., Horvath, F., Pecsvaradi, A., Kiss, G., Szepsi, A., Szabo, M., and Erdei, L. 2002. Acclimation of tomato plants to salinity stress after a salicylic acid pre-treatment. Acta Biologica Szegediensis 46 (3): 55-56. Zhou, X., Mackeuzie, A., Madramootoo, C., and Smith, D. 1999. Effect of some injected plant growth regulators with or without sucrose on grain production, biomass and photosynthetic activity of field grown corn plants. Journal of Agronomy and Crop Science 183: 103-110.